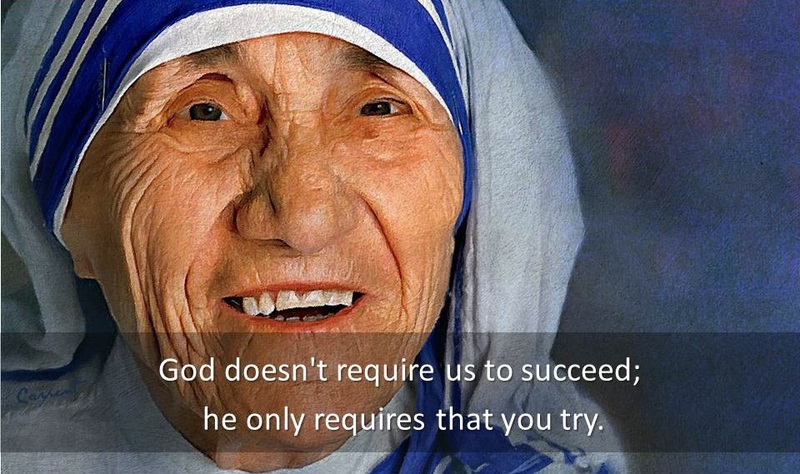 Welcome to Mother Teresa Quotes. Here you will find famous quotes & quotations by Mother Teresa. Joy is prayer. Joy is strength. Joy is love. Joy is a net of love by which you can catch souls. The dying, the cripple, the mental, the unwanted, the unloved-- they are Jesus in disguise. The poor give us much more than we give them. They're such strong people, living day to day with no food. and they never curse, never complain. We don't have to give them pity or sympathy. We have so much to learn from them. The silence is so great that I look and do not see, listen and do not hear. The tongue moves in prayer but does not speak. There is a terrible hunger for love. We all experience that in our lives--the pain, the loneliness. We must have the courage to recognize it. The poor you may have right in your own family. Find them. Love them. There should be less talk. A preaching point is not a meeting point.